Dinner Lady Strawberry Macaroon 60mLA strawberry macaroon with just the right amount of sweetness co..
Tuck Shop - Apple Sours 60mL by Dinner LadyA nostalgic favorite with a kick. Sweet apple balanced wi..
Tuck Shop - Lemon Sherbet 60mL by Dinner LadyThe classic lemon boiled sweet. Enter a citrus explosio..
Tuck Shop - Bubble Trouble 60mL by Dinner LadyIt’s so good you’ll be chewing your clouds. The iconic..
Tuck Shop - Watermelon Slices 60mL by Dinner LadyEveryone will want a slice. Refreshing watermelon w..
Tuck Shop - Sweet Fusion 60mL by Dinner LadyA burst of chewy fruits. 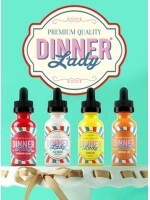 This multicolored sweet se..
Dinner Lady - Mango Tart 60mLMango Tart: ﻿The fresh taste of real mangoes filling an ..
Dinner Lady - Berry Tart 60mLBerry Tart: ﻿The warm taste of a freshly baked tart pastries fille..
Dinner Lady SALT - Cola Shades 30mLAvailable in 30mg & 50mg nicotine strengths.This flavor is a ..
Dinner Lady SALT - Blackberry Crumble 30mLAvailable in 30mg & 50mg nicotine strengths.This flavo..
Dinner Lady SALT - Lemon Tart 30mLLemon Tart SALT by Dinner Lady is inspired by everyone's favorite ..
Dinner Lady Rice Pudding 60mLRice Pudding by Dinner Lady provides a velvety, creamy rice pudding dol..
Dinner Lady Cornflake Tart 60mLCornflake Tart by Dinner Lady is an old school flavour drenched in no..
Dinner Lady Lemon Tart 60mLLemon Tart by Dinner Lady is inspired by everyone's favourite lemon puddi..
Dinner Lady Strawberry Custard 60mLStrawberry Custard by Dinner Lady features a different twist on a..